Gated entrance with 24-hour security. All Accommodations are NON-SMOKING. For guests who do smoke, you are steps away from a designated smoking area. Ashtrays are provided on the patio or balcony area outside each villa. and the West Village Clubhouse has designated smoking areas in the outdoor stairwell area on each floor. Take Hwy US 192 west (approx. 5½ miles from the I4 / US 192 intersection) to Orange Lake Resort on your right. Follow the signs to the golf course. Nice complex. Liked having everything we needed in one location. Wish we had more time to explore. We enjoyed the golf. An outstanding place to stay loved the 5 days. Excellent accommodations and golf courses. Very good accommodations. Staff very courteous and helpful. Everyone in my group (26) had nothing but good things to say. We enjoyed the resort. The pools were great. The rooms were decent, however, the carpet was old and dirty. Outstanding resort and accommodations. Great staff and amenities, will definitely look to return. Orange Lake is a breath of fresh air in the very busy Orlando area. Clean, quiet, wildlife, a wonderful experience. Multiple pools, restaurants at very reasonable prices, and good golf courses. The accommodations were fine. Rooms are very nice, spacious. We've stayed at Orange Lake a few times and will come back again. We thoroughly enjoyed our stay here. The condos were clean and well appointed. We will be back! I would highly recommend the 3 bedroom over the 2 bedroom for 4 adults. There was plenty of room to relax and unwind after playing golf all day. The extra living space and updated rooms were very nice. Had a great time. Villa was comfortable. Hotel was a great accommodation. Close by to plenty of restaurants and grocery stores. Couldn't beat the price Plenty of space and everything was clean. Played the Reserve golf course which was a good layout. Would definitely stay here again. The resort is mostly families with young kids or older folk so if your looking for a party resort this isn't the one for you. We were there only to play golf, and not to really enjoy any of the amenities of the property. The property is huge, so please keep that in mind. It takes 4-5 minutes to drive back to your individual condo (depending on location I guess). The room was spacious and we had a walk-out patio on the back that we were able to enjoy after our daily golfing. For us, it worked just fine. The resort itself is terrific. Well manicured in every way. The room was also extremely nice. Excellent resort, definitely would recommend it. This place was great. Clean rooms and they looked new. Far exceeded our expectation. The resort is excellent, wish they also allowed us a late checkout. Still excellent experience. Excellent accommodations, well located close to golf, restaurants, Disney. Unbelievable customer service. My second time at this location and not my last. The rooms were very nice. Comfortable and well equipped. Would definitely use again. Awesome! The Villa was beautiful - well appointed and very comfortable. I will highl recommend. Fantastic set up... nice 2br condo. Clean and efficient well appointed. Would stay there again. Good first day course.After 3 hour flight - not too demanding - worked out the travel stiffness Played in 4hrs. 15 mins.Finished in daylight after 1.30 teetime. great place to stay with 2 solid golf courses on site. Central place to stay with many other golf courses in the area..
All was good - clean - equipped. The accomodations here were excellent. We would definitely stay here again. Beautiful accommodations! Great value! I would definitely book another stay. Outstanding accommodations - and everything handy to get to . All golf courses within 30 min. drive.Looking forward to next trip to Orlando - and using Tee Times USA. Orange Lake was as usual clean and a great centrallocation for us to call home base. Once we got everybody to there rooms - the place wasgreat. Staying at Orange lake resort was very comforting. I will be coming again and again...great place to stay at for all ages. Rooms are always clean and and have pretty mucheverything that's needed for eating to relaxing. Any problems andthey come within minutes to help fix the problem. Great place tostay! We stayed last year also and again the place wasgreat. Very comfortable and clean. Outstanding service - great accomodations - wonderful staff and very nice facilities. Very nice resort. Perfect for what we were lookingfor. Can't think of anything that wasn't ideal. Thanks a bunchTee Times USA for a great trip. Beautiful accommodations. We had a 3 bedroom condo. Worked out great. We had a beautiful high rise Villa overlooking TheLegends Course. Overall very satified with accommodations and Legendsis terrific. Accommodations were great. We loved the place and allthat it offered. If you have stayed at Orange Lake Resort, we would like to hear from you. The nightly resort fee is waived for all Tee Times USA guests. Located in the heart of Orlando's attractions, Holiday Inn Club Vacations at Orange Lake Resort features four exceptional courses open to the public that will challenge and delight golfers of any skill level. Discover 54 diverse and picturesque golf holes, all within a deluxe, 1,450-acre resort you won't want to leave. The Legends at Orange Lake Resort is a challenging Arnold Palmer Signature Course, a masterpiece that allows golfers to feel as though they've traveled from the legendary links of Scotland to the classic pines of North Carolina. Plus, The Reserve at Orange Lake Resort re-opened in 2005 with several new water features and bunkers. It was all designed by architect Mike Dasher to be in perfect harmony with the surrounding wetlands. 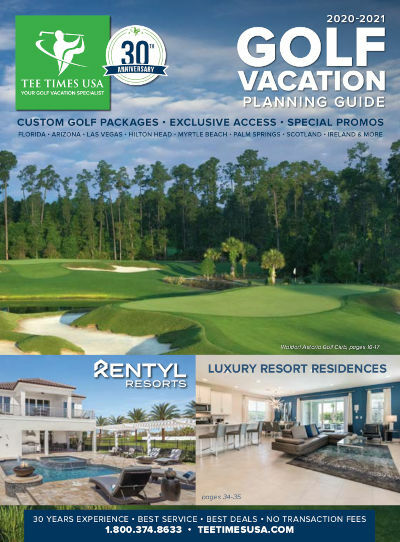 In addition, there are two 9-hole, par 3 executive golf courses-including the only course in Florida golf lighted for nighttime play-that can offer any golfer the opportunity to experience the resort's brand of golf. You can also learn the game and develop your skills with Rick McCord, recognized by Golf Magazine as one of the "Top 100 Teachers in America," at the McCord Golf Academy, named one of the "Top 25" golf schools in America. Choose a clinic or private instruction to discover your true golfing potential. But golf is only the beginning, as Holiday Inn Club Vacations at Orange Lake Resort has so much more to offer. The resort is comprised of four resort villages featuring a 12-acre waterpark with a lazy river pool and cabanas, seven swimming pools, nine restaurants, retail shops, hot tubs, arcades, fitness centers, business centers and Internet cafes. While on property, families can also enjoy an 80-acre lake with a sandy beach and watersports, miniature golf on one of two 18-hole courses and activities tailored for all ages. These units are self catering. For your convenience, you will be provided with a starter kit upon arrival containing basic supplies including a limited amount of paper supplies, etc. You may wish to bring or shop for additional items to make your stay more comfortable. The resort is a cashless resort. A credit card deposit hold of $250 per unit is required upon check-in. All purchases may be made with a credit or debit card or charged to your room portfolio if you are an on-site guest. Cash, however, is accepted on the beverage carts on the golf courses.